BIRD ISLAND, Antarctica -- Scientists from British Antarctic Survey, National Institute of Polar Research, Tokyo, and Hokkaido University, Japan, have recorded the first observations of how albatrosses feed alongside marine mammals at sea. A miniature digital camera was attached to the backs of four black-browed albatrosses (Thalassarche melanophrys) breeding at colonies on Bird Island, South Georgia in the Southern Ocean. Results are published online this week in the open-access journal PLoS ONE from the Public Library of Science. The amazing pictures reveal albatrosses foraging in groups while at sea collecting food for their chicks. It also provides the first observation of an albatross feeding with a killer whale – a strategy they may adopt for efficiency. The camera, developed by the National Institute for Polar Research in Tokyo, is removed when the albatross returns to its breeding ground after foraging trips. It is small (the size of a packet of a large lipstick) and weighs 82g. Although the camera slightly changes the aerodynamic shape of the albatross, it didn't affect the breeding success of the study birds. "These images are really interesting. 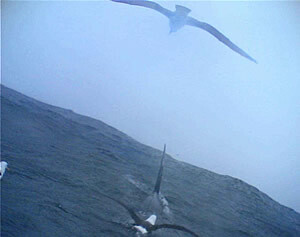 They show us that albatrosses associate with marine mammals in the same way as tropical seabirds often do with tuna. In both cases the prey (usually fish) are directed to the surface and then it's easy hunting for the birds." The study took place at the breeding colony of black-browed albatrosses at Bird Island, South Georgia in January 2009, as part of a UK-Japan International Polar Year 2007-9 project.